Welcome to our virtual financial literacy resource page. Below, you will find two options. The first option is through our partnership with the Centsables. If you purchase that program at our deeply discounted rate, you’ll have everything you need to help make people financially literate. The second option, Empowering Generations Through Financial Literacy, gives you a slide presentation, video and scripts to use with audiences to inspire them to become financially literate on their own. Thank you for considering helping strengthen our communities through financial literacy! The Centsables Financial Literacy initiative is a breakthrough multi-media program for kids, teens and young adults. Since its inception, the initiative has received accolades, including Telly Awards, Parents Choice Awards, American Bankers Association, Cynopsis Kids, Academics Choice Awards and FCS. A 13-episode animated TV series, which was broadcast nationally on Fox Business Network, is now available as a link to your website. The Centsables have been featured on WCBS Radio Business News, Smart Money Magazine, Newsday, Wall Street Journal, Bloomberg, Barrons and more. And the program is ready to become your business-building tool! 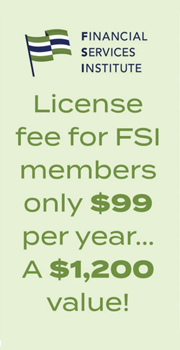 FSI and our member firms are committed to empowering all generations toward financial freedom. To assist our members, we have collaborated with our Marketing, Growth & Development Council to create resources for FSI members. These resources and tools assist in raising awareness across multiple generations regarding the benefits of financial freedom through financial literacy, and include presentations members can personalize or customize for use in raising awareness among young adults as well as near-retirees and retirees in their local region. Young adults can benefit from a focused discussion of the benefits of financial freedom. While the specifics may vary on an individual level, the high-level focus should include the following benefits: choice, lifestyle, security, emotional well-being, ability to help others, and time to focus on their personal passion. Real success begins with identifying what is important, and then setting goals and steps for success. For many people, they have spent a lifetime of hard work to accumulate what they have, and they need to be aware of how to protect their financial interests. Everyone also needs to aware of financial abuse, which largely seems to go unreported. Insight for the greatest generation and baby boomers is important because they have worked hard to get where they are today, and they may not be aware of the resources available to them at a federal level such as social security, Medicare, Medicaid, Low Income Home Energy Assistance Program (LIHEAP), SNAP program, Senior Community Service Employment Program (SCSEP), or Senior Health Insurance Assistance Program (SHIP). Programs may also be available on a state and local level. Please complete the form below to download PowerPoints, talking points and videos for each of the presentations. Please Note: this material is provided for informational purposes only and is not intended as legal advice. Please consult with your firm’s Legal and Compliance Department and your firm’s policies and procedures, for further guidance related to any specific scenario you may have. Working with an independent financial advisor can help you get on the right track to achieving your financial goals. Click here for resources to help you get started.